​Thank you to all who attended and contributed to our March Madness - FAME re-visited. Many of this year's FAME attendees presented to our fellow media specialist on a variety of timely topics. Thank you to : Lauren Martino, Ronette Yarborough, Dione Mila, Diana Haneski, Maria Miranda, Pamela Gallo, and Lourdes Boza Meyer. We had some very productive sessions on: Speed Dating with Books, Toot Your Own Horn, Makerspaces, Student Leadership in the Media Center, Florida Teens Read, Sunshine State Young Readers Award, Hot Topics for High School, and Media Medley. These are all hot, trending topics for your media center. The participants left with many wonderful ideas they could implement into their media centers immediately. The participants were thrilled and are looking forward to next year. You don't want to miss next year's FAME Re-visited. School Library Month is the American Association of School Librarians' celebration of school librarians and their programs. Every April school librarians are encouraged to host activities to help their school and local community celebrate the essential role that strong school library programs play in transforming learning. This year's spokesperson is famed children's author Dav Pilkey Be sure to check out School Library celebrations going on in your school's media center in April. 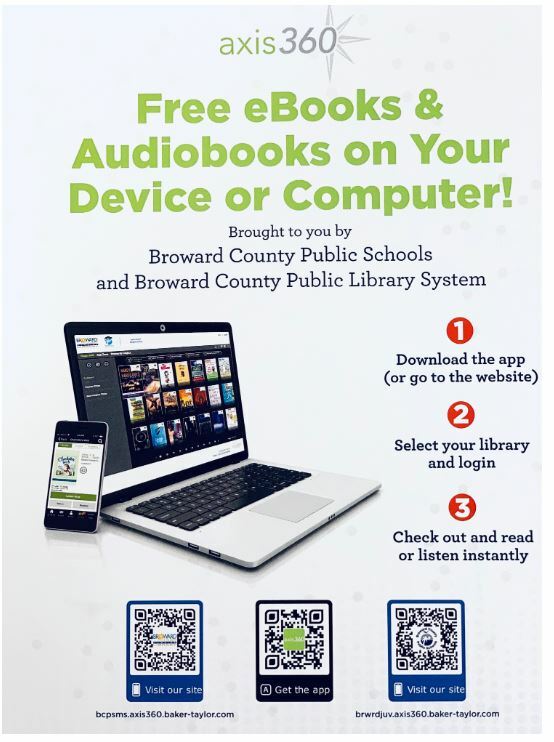 Below are some images brought to you by some of our wonderful media specialist and libraries in Broward County! Thank you students of Everglades Elementary and Media Specialist Jessica Schneider for this beautiful banner which is proudly displayed at the entry of KCW! ​Thank you students of Lyons Creek Middle School and Media Specialist Celia Taylor for this lovely banner for the entry at KCW!